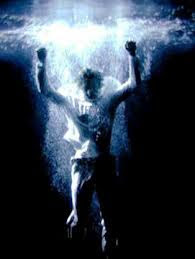 Less Petals;More Thorns: Kira Perov's Greatest Public Success: Bill Viola. Kira Perov's Greatest Public Success: Bill Viola. 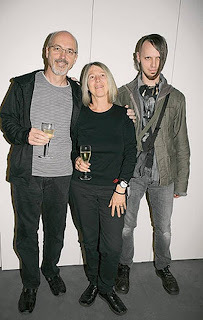 Bill Viola, Kira Perov, and Skrillex!!!!! nope, it's their son, Blake. Why isn't Kira's name following or preceding Bill's name on all of the works? Their art appears to be joint work; their spiritual encounters, videotaping, editing, etc. Should've gone to that Q&A session. rats. I had the delight of having lunch with these two (and others, but delight may be an exaggeration on that part, not based on people's character, but familiarity and repetition). I observed, hoping to find the answer to my one question (the one above). I never learned the answer, but I was satisfied enough knowing that she is the more interesting of the two. Understandably, if she were in the spotlight, she may just steal it all away. She is the Mrs. behind the scenes dragging him along on her life journey. It makes me wonder if she wrote his talk for convocation... Brains behind the beard, she is. Kira Perov is modest and likes chocolate. She and I have one thing in common. Here are the notes I took during Convocation during which Bill spoke and talked and spoke. monotone voices. long monotonous noises. The words he spoke were inspirational to those who believe they require fuel and nutrients as such. And there he was. Bill Viola (Italian; Vee not Vie) Rooting;Clapping;For himself. Bill Viola, Fire Woman, 2005, video still. kaleidoscope effect on the bottom of the fire. Goes to a, Like a reflection in water. blessed to be entering a world that is falling apart. who are you when you go into your studio, no distractions. No interactions with others. I can barely listen to this guy because I keep watching the background, which is a group of people seeming to experience all sorts of emotions. Cant control arm movements. Japanese death poems are great: we will have a party. Death and saved by images. we must bring these things together. its about morality and stuff. They're both vegetarian and totally dig Japan, by the way.